Polyonics ESD-Safe label and tag materials help protect ESD sensitive devices and have proven to be valuable tools in helping reduce the occurrence of electrostatic discharge in ANSI/ESD and JEDEC Control Plans. The materials comply with the latest ANSI/ESD S20.20 and JEDEC JESD625B requirements for process required charged insulators used in the proximity of ESD sensitive devices. Polyonics family of ESD-Safe polyimide and PET label and tag materials provide static dissipative surface resistances greater than 114 and less than 1011 Ohms and low charging pressure sensitive adhesives (PSA) and liners that generate less than 125 volts when separated. Click on title to view on You Tube"
Polyonics XF-791, XF-792 and XF-793 asset tags are the newest addition to the ESD-Safe product portfolio. The ESD-Safe tags consist of a 5 mil polyester with static dissipative coatings on both the top and bottom side of the tag and are designed for thermal transfer printing on both sides. XF-791 is white on both sides. XF-792 is yellow on the top side and white on the bottom, and XF-793 is orange on the top side and white on the bottom. The asset tags are used to track circuit boards and sub-assemblies and meet ANSI/ESD S20.20 and is static dissipative per ANSI/ESD S541. Polyonics XF-781 and XF-782, 1 and 2 mil polyimide-based ESD-Safe label materials, are designed for top and bottom side PCB applications. They remain dimensionally stable when exposed to the high temperatures and harsh chemicals, solders, fluxes, cleaners, etc. 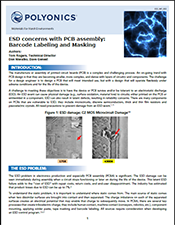 used in both lead-free and standard PCB manufacturing processes. Polyonics XF-446 is a 2 mil white ESD-Safe polyester label material is designed for topside PCB applications plus provides a cost effective solution for applications under 400°F (204°C). Polyonics ESD-Safe label materials have proven to help designers and manufacturers protect their most ESD sensitive devices from electrostatic charges arising from both human contact (HBM) and charged devices (CDM) and have become valuable elements in the successful S20.20 and JESD625B ESD control plans of global electronics and microelectronics EMS’, ODMs, converters and OEMs. Polyonics has worked with leading experts and consultants within the electronics community, ANSI/ESD S20.20 and JEDEC JESD625B standards committees to develop a comprehensive white paper that defines the ESD problem, describes the certified industry test standards and offers guidance as to how best to reduce ESD risks associated with process required insulators. The ESD white paper and supporting third party test data are available as downloads from this page. 6 The complete ribbon compatibility chart can be found here. Barcode labels made from Polyonics ESD-Safe polyimide and polyester materials comply with the latest JEDEC JESD625B standard for charged insulators. They generate less than 125 volts when their liners are removed and are safe to use within 1" of static sensitive devices.